Trees are cultivated in public and private landscapes in and around cities and towns. They are grown for the tremendous contributions they make both to the environment and the quality of people’s lives. In this urban forest, trees must be removed when they die or for reasons of health, safety or necessary changes in the landscape. The wood from these felled landscape trees could potentially be salvaged and used to manufacture wood products but not in the same way as forest-grown trees. This publication describes some key differences between wood products from traditional forests and those available from urban forests. 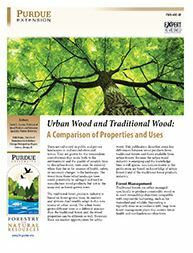 Urban Wood and Traditional Wood: A Comparison of Properties and Uses is available at The Education Store as a free download.